The Lion King is a 1994 American animated musical film produced by Walt Disney Feature Animation and released by Walt Disney Pictures. It is the 32nd animated feature in the Walt Disney Animated Classics series. The story takes place in a kingdom of lions in Africa, and was influenced by the biblical tales of Joseph and Moses and William Shakespeare's play, Hamlet. The film was produced during a period known as the Disney Renaissance. The Lion King was directed by Roger Allers and Rob Minkoff, produced by Don Hahn, and has a screenplay credited to Irene Mecchi, Jonathan Roberts and Linda Woolverton. Its original songs were written by composer Elton John and lyricist Tim Rice, and original scores were written by Hans Zimmer. The film features an ensemble voice cast that includes Matthew Broderick, James Earl Jones, Jeremy Irons, Jonathan Taylor Thomas, Moira Kelly, Nathan Lane, Ernie Sabella, Rowan Atkinson, Robert Guillaume, Madge Sinclair, Whoopi Goldberg, Cheech Marin, and Jim Cummings. The Lion King tells the story of Simba, a young lion who is to succeed his father, Mufasa, as king; however, after Simba's uncle Scar murders Mufasa, Simba is manipulated into thinking he was responsible and flees into exile in shame and despair. Upon maturation living with two wastrels, Simba is given some valuable perspective from his friend, Nala, and his shaman, Rafiki, before returning to challenge Scar to end his tyranny. Development of The Lion King began in 1988 during a meeting between Jeffrey Katzenberg, Roy E. Disney and Peter Schneider while promoting Oliver & Company in Europe. Thomas Disch wrote a film treatment, and Woolverton developed the first scripts while George Scribner was signed on as director, being later joined by Allers. Production began in 1991 concurrently with Pocahontas, which wound up attracting most of Disney's top animators. Some time after the staff traveled to Hell's Gate National Park in Kenya to research on the film's setting and animals, Scribner left production disagreeing with the decision to turn the film into a musical, and was replaced by Minkoff. When Hahn joined the project, he was dissatisfied with the script and the story was promptly rewritten. Nearly 20 minutes of animation sequences took place at Disney-MGM Studios in Florida. Computer animation was also used in several scenes, most notably in the wildebeest stampede sequence. The Lion King was released on June 15, 1994, to a positive reaction from critics, who praised the film for its music, story and animation; it finished its run as the highest-grossing release of 1994. Following a 3D re-release in 2011, with earnings of over US $987 million worldwide as of 2011, the film is the highest-grossing hand-drawn animated film in history, the highest-grossing 2D animated film in the United States, the third highest-grossing animated film of all time, and the 23rd-highest-grossing feature film of all time. The Lion King garnered two Academy Awards for its achievement in music and the Golden Globe Award for Best Motion Picture – Musical or Comedy. 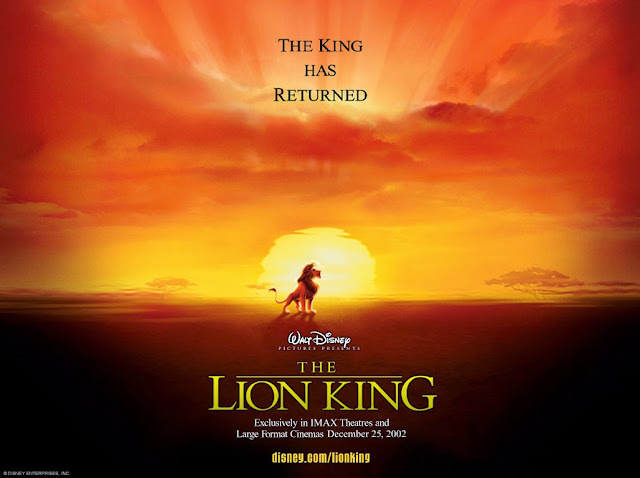 The film has led to many derived works, such as a Broadway adaptation, two direct-to-video follow-ups—the sequel The Lion King II: Simba's Pride (1998) and the prequel/parallel The Lion King 1½ (2004)—and two spin-off series Timon and Pumbaa and The Lion Guard. The next day Scar lures Simba to a gorge and tells him to wait there while he gets Mufasa. On Scar's orders, the hyenas stampede a large herd of wildebeest into the gorge. Mufasa rescues Simba, but as Mufasa tries to climb up the gorge's walls, Scar throws him back into the stampede, where he is trampled to death. After Simba finds Mufasa's body, Scar convinces him he was responsible for his father's death and advises Simba to flee the kingdom. As Simba leaves, Scar orders Shenzi, Banzai and Ed to kill the cub, but Simba escapes. That night, Scar announces to the pride that both Mufasa and Simba were killed in the stampede and steps forward as the new king, allowing a pack of hyenas to live in the Pride Lands. After running far away, Simba collapses from exhaustion in a desert. Timon and Pumbaa, a meerkat and a warthog, find him and nurse him back to health. Simba subsequently grows up with them in the jungle, living a carefree life with his friends under the motto "hakuna matata" ("no worries" in Swahili). When he is a young adult, Simba rescues Timon and Pumbaa from a hungry lioness, who turns out to be Nala. She and Simba reconcile and fall in love. Nala urges Simba to return home, telling him the Pride Lands have become a wasteland with not enough food and water. Feeling guilty over his father's death, Simba refuses and storms off, leaving Nala disappointed and angry. As Simba exits the jungle, he encounters Mufasa's mandrill friend and advisor, Rafiki. Rafiki tells Simba that Mufasa is "alive" and takes him to a pond. There Simba is visited by the ghost of Mufasa in the sky, who tells him he must take his rightful place as the king of the Pride Lands. Simba realizes he can no longer run from his past and goes home. Nala, Timon, and Pumbaa join him, and agree to help him fight. At the Pride Lands, Simba sees Scar hit Sarabi and confronts him, but Scar taunts Simba over his "part" in Mufasa's death. However, when Scar pushes Simba to the edge of Pride Rock, he reveals that he Mufasa. Enraged, Simba roars back up and forces Scar to reveal the truth to the pride. Timon, Pumbaa, Rafiki, Zazu, and the lionesses fend off the hyenas while Scar, attempting to escape, is cornered by Simba at the top of Pride Rock. Scar begs Simba for mercy, saying he is family and placing the blame on the hyenas. Simba says he does not believe Scar anymore but spares his life and commands him to forever leave the Pride Lands. Scar meekly walks past him, but then attacks his nephew. After a fierce fight, Simba throws his uncle off Pride Rock. Scar survives the fall, but is attacked and eaten alive by the hyenas, who overheard his attempt to betray them. With Scar and the hyenas gone, Simba ascends to the top of Pride Rock and takes over the kingdom as the rain falls again. Sometime later, with Pride Rock restored to its former glory, Simba looks down happily at his kingdom with Nala, Timon, and Pumbaa by his side; Rafiki presents Simba and Nala's newborn cub to the inhabitants of the Pride Lands, and the "circle of life" continues.